The Virgin Islands, Tortola to Anegada. Scale: 1 : 87,550. Larger scale plans of Gorda Sound, South Sound, Roadtown Harbour and approaches, Virgin Gorda Yacht Harbour. Flat chart, water-resistant paper. 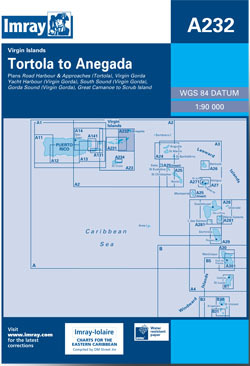 For this edition, the plan of Gorda Sound (Virgin Gorda) has been reschemed - the new version has been drawn at a larger-scale of Scale: 1 : 25.000 to show passages more clearly, and to show various marina developments, the plan of Road Harbour and Approaches has been divided into two plans - one of Road Harbour, and one of Fat Hogs Bay and Maya Cove, and the latest known depths have been applied throughout.